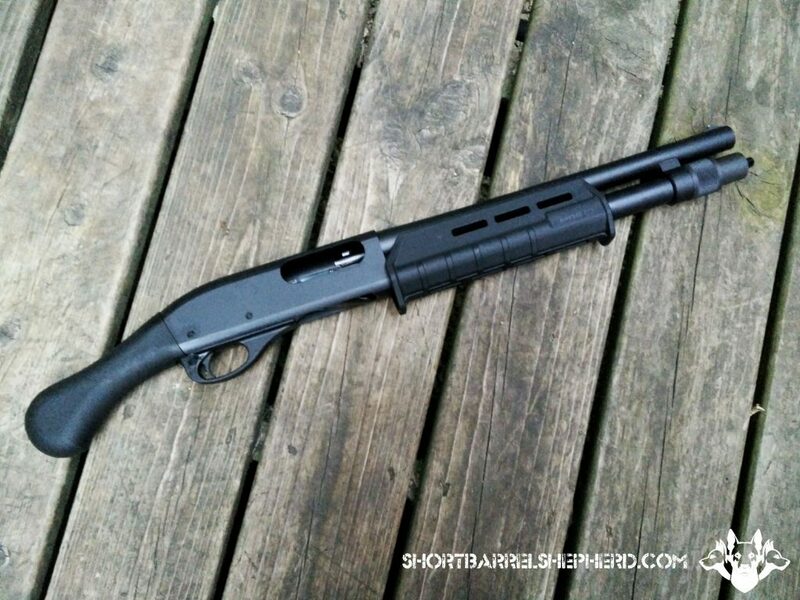 Earlier this month I bought a Remington 870 Tac-14 firearm (please read our initial write-up). I’ve been very busy with a new job, changes in schedule, out of town guests, and training, so I haven’t had a chance to start my the Tac-14 project in earnest until last weekend. The first modification was to install a Scattergun Technologies +1 magazine extension tube. 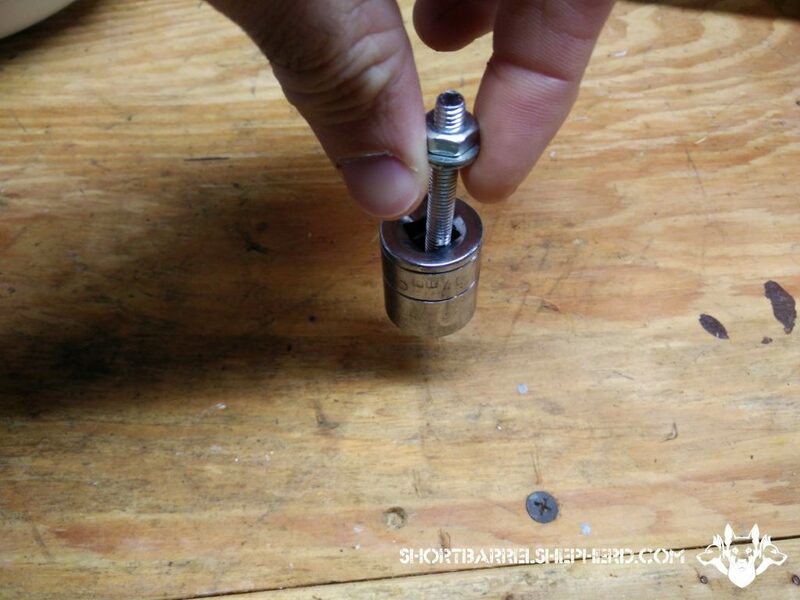 It seemed easy at first (unscrew the old mag tube cap, remove spring and follower, install new spring and follower, screw on new mag tube cap), but like most things there was a catch. In this case, an actual catch — two dimples in the mag tube prevented the new follower from moving in the tube, which kept me from adding an extra shotshell. I made my friend a promise not to use my drill press on any of my guns any more without his direct supervision (long story). There were all sorts of warnings and advice on the Internet. Warning: do not let the socket go too far into the magazine tube. Warning: do not use too much force and cause damage to the tube or the receiver. Warning: do not use too wide of a socket and bell / bend the magazine tube so that you can’t thread the new cap on. Advice: use lubrication (but not too much!) to help the socket push the dimples, and to help you extract the socket. Advice: use a long-drive (longer) socket for extra surface area / leverage when pulling the socket back out. No problem! Let’s get to work. I started out with a long drive socket as directed, but the one I used was too narrow to completely flatten the dimples. It was noticeable improvement, but not enough to accommodate the follower, nor wide enough to allow for hammering from the other side. I had other long drive sockets, but they seemed just a little too wide. I was uncomfortable using them. I got the socket stuck in the magazine tube. Like, so stuck I got nervous and forgot to take a picture kind of stuck. A quick search on the Internet revealed that most people failed to extract the socket and wound up purchasing an entirely new receiver. One brave / desperate person continued to hammer in more and more sockets until the bottom one pushed out. After he was finished, he discovered he had a slightly enlarged tube that no longer worked reliably. I decided to not do anything else stupid, and stepped away for about 24 hours. Here’s how I bailed myself out of trouble, without causing damage to the 870. Your mileage may vary. I am not a gunsmith. Do this at your own risk. This is not legal advice. This is what you are trying to accomplish with the bolt, washers, and nut. Afterwards I finished the installation, and cycled a bunch of dummy 12 gauge shells through the Tac-14. No deformation of the tube, no damage to the receiver, no thread wreckage. So, if you get a socket stuck in your Remington 870 give this a try and let me know if it worked for you. 2 Comments on "Socket to Me, or How to Remove a Stuck Socket From a Remington 870 Magazine Tube"
Use a one inch scope mount or similar mount over the detents so there is no chance of deformation.